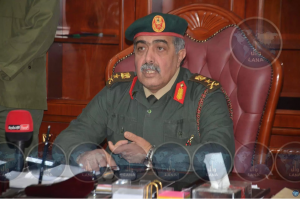 Major General Abdul Razzaq Al-Nazhuri, the military governor from Ben Jawad to Derna and chief of starff of the Libyan National Army (LNA), has followed the steps of Field Marshal Khalifa Hafter’s son and employed a company to lobby for him in Washington. According to a declaration lodged with the US Justice Department’s Foreign Agents Registration Unit (FARA), Keystone Strategic Advisers will act as lobbyists for the “Governor of Eastern Libya”. The details are brief and not quite to the point. Nazhouri is described as “Mr Al Marj” and his address given as 10 Omar Mukhtar Street Benghazi. The $450,000 year-long contract with Keystone, paid in advance and starting on 1 December, is for “strategic political and. communications counsel to the foreign principal, including developing policy and foreign relations goals, arid assisting in developing a democratic and multi-ethnic Libya”. This is reported to be the first foreign client for Keystone which is run by Ari Mittleman and Vladimir Petrovic. Last month, Hafter’s son Khaled signed a six-month PR contract with Daniel Faraci of Grassroots Political Consulting to lobby on behalf of his father and Hafter family.